Thinking of getting your bachelor’s degree in art? Before you choose your school, learn about the best art colleges by graduate earnings. Good news – you can study art without ending up as a starving artist. 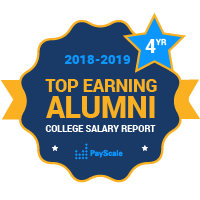 Just pay careful attention to PayScale’s ranking of art colleges by graduate earnings for alumni who received their bachelor’s degrees at the art and design schools listed here. Art school has a bad reputation for leaving heavily indebted grads with low-paying jobs, but some art and design school alumni fare pretty well in terms of post-grad salaries. But following your muse doesn’t necessarily translate to a meaningful career. Some art and design majors have a low sense of job meaning; for some schools, less than a quarter of their graduates say that their jobs make the world a better place.